5 Must Haves for Your K Classroom! Mgt FREEBIES too! Being a seasoned teacher gives many of us an advantage over first year teachers in knowing what really works in a kinder classsroom. We have had many, many trial/errors over the years. We have found what makes our daily routines go well, and what doesn’t. In this post I want to share 5 Must Have features of the k classroom. These are things that are simple, and in most cases at no cost to you unless you want more frills…in which case you know where the local Dollar Tree or Target Dollar Spot is :). 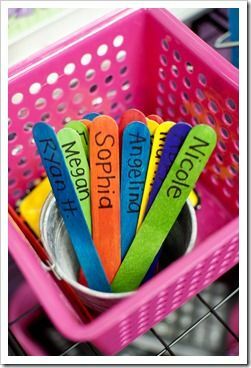 Craft sticks with magic marker names. Brag Tag Cards on a chain for the Teacher to wear. Just flip to the next card, or put a place holder between the card of the previous student and who is next. Small full body image of the student on a card that fits the bucket. Every classroom needs a method of assigned seating for floor time! I have tried sit-where-you-choose every year, but at some point, students get familiar with each other and there is constant chatter. By this time I have a good idea of who are such besties they are losing focus during lessons. I like to make a seating chart using #Sit Spots. You determine the arrangement, but I find it easy to mix the colors in the rows of spots. That way little Jon can go to green on row 1, Susie can go to red on row 3 etc. I use the seating arrangement to call rows for lots of things throughout the day too! Rows 1 and 2 can help with a kinesthetic math activity, etc. I have a good friend who uses Sit Spots for graphing too (http://mrspriceskindergators.blogspot.com). Be sure to read her blog! I recommend four or five colors of spots, or just get the assortment pack. They hold up extremely well when you wash them at the end of the year, and there are very few frayed edges to trim up. Watch their site for special discounts through the summer. Also, bloggers have contests to give them away from time to time. After trying many types of seating spot markers, Sit Spots are the best! Here is an organization FREEBIE to help you keep track of who sits where, because we all kids will try to remix seating themselves, lol. I like to keep this on a clipboard for making changes on the spot–and they WILL happen. If you want to keep this information on your desktop, it opens in ppt and is editable! For your own color or shape choice Sit Spots, here is a blank version. A great group behavior management plan! There are some wonderful ideas on several blogs. This is the one I use, and it gives the kids a chance to work as a team. On the back of a painted baking sheet, I have 2 ten frames and an assortment of magnets. Each time students earn a point for listening as a cooperative group, I add a magnet to their ten frame. Each time they forget the group participation rules, I add a magnet to my ten frame. This not only reinforces counting concepts, it also gives them a way to compete for points with the teacher board. When they have filled their board, they are rewarded with a dance break, extra recess minutes, or whatever no-cost-to-you incentive you want to use. If the teacher board gets full first, you give yourself an incentive and start all over. It doesn’t take long for students to decide they want to win this great participation challenge. I have also incorporated a number line and a race car into my board. Love this system for whole group! If you want to grab my board graphics, I have included them here as another FREEBIE! There are several other organizer ideas here. Paperwork is unavoidable…even when you are a mostly paperless classroom. There are always documents the school wants sent home, or possibly math and reading workbook pages. The quickest transfer from collection to sending home is this great organizer from Amazon. I have two of them: One is for everyone’s name work, and the other is for their daily folders. 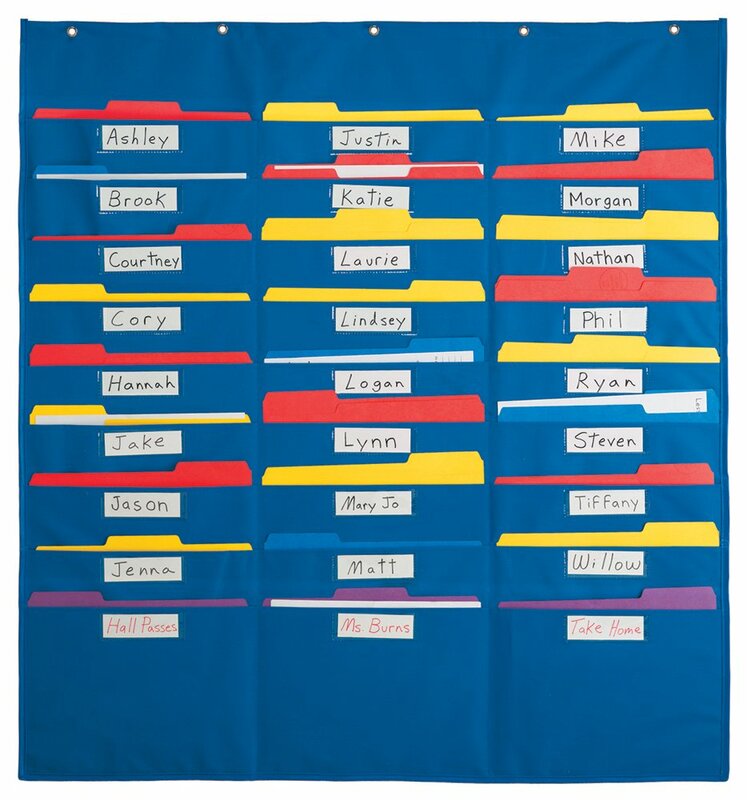 All work that I have seen goes in front of their daily folders in this pocket organizer. Students or my A+ aid are responsible for putting the work into the daily folders. I can see at a glance who remembered to bring their daily folder, and I can see if I have loaded all slots with work I have seen for the day. Love this setup! As an additional tip, I ordered enough for two class sets of these cute Eric Carle folders last year. They are coated with a write on/wipe-off coating, but I made name labels for identifying folders on the outside. I wrote names in permanent marker on the inside. What 5 must-haves do you recommend for new teachers? I’d love to have you add your thoughts in the comments below. The first 5 people who comment will receive a product of $5 or less from my TpT store! And GO! These are fabulous! Sharing now! I have my camera with me on meet the teacher night and take a picture of each child (holding his/her nametag) with his/her family. I print the pictures that night and post them on my door the next morning. This helps me make sure that I get the child matched with the right family at pick-up time. It also helps if I have a substitute some day. A few weeks after that, I make the pictures into collages and put them in 8 x 10 frames on my door. They take up less space and do not blow off as easily. This is a great idea for arrival/departure time! Thank you for sharing! Be sure to pick out a prouct from my store. You are winner #2. These are GREAT ideas for teachers! Thanks for sharing! You are the 3rd winner. 🙂 Pick out something from my store and let me know! I like the organizer you suggested. We are trying take home folders this year and it looks like a great way to keep track of everything for the day! You are #4. Pick something from my store for $5 or less! I love folders, and even when my kids folded them to fit their backpacks, these held up pretty well. And have a good set of brain breaks ready – music, movements, etc. They will need to move, and you want it go be somewhat controlled. I have two suggestions. First is to have a plan for where you want everything to go when the kids first arrive. This includes backpacks, lunches, jackets, etc. You definitely don’t want them deciding for you. Second, have a good, fun, easy set of brain breaks planned. These can be movements, songs, etc. They need to be able to wiggle, and you want it to be somewhat controlled. You are #5! Pick something of 5$ or less from my TpT store! Thank you for your comment I agree with all of the above!